The ONU HealthWise Pharmacy is managed by registered pharmacist Katie Westgerdes, a 2013 graduate of the ONU College of Pharmacy. ADA — The Ohio Northern University HealthWise Pharmacy, which recently opened in the Robertson-Evans Pharmacy Building on Lincoln Avenue, will not only serve the community but will also provide students with more education. Extending health-care services to area residents and providing a practice site for ONU College of Pharmacy students to gain real-life experiences are some of the benefits that the pharmacy offers. The pharmacy also provides patient education and resources, medication therapy management, a medication synchronization program, and a compliance packaging program. The public full-service community pharmacy, which is open from 10 a.m. to 6 p.m., also sells over-the-counter medications and accepts most prescription insurance plans like the UMR, the ONU employer insurance. 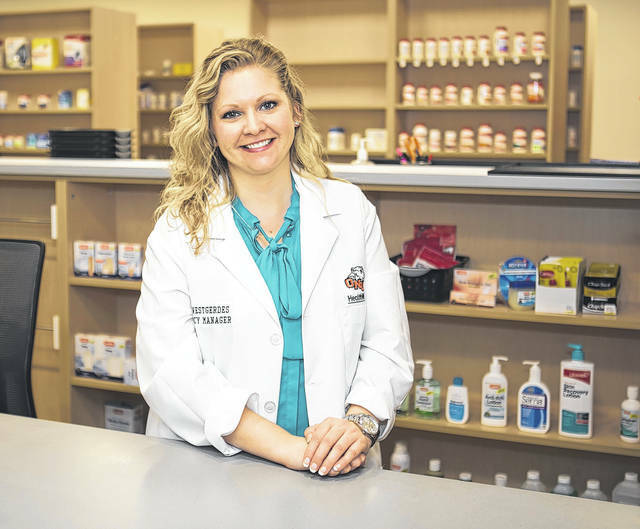 https://www.limaohio.com/wp-content/uploads/sites/54/2018/01/web1_HEALTHWISE-PHARMACY-1-.jpgThe ONU HealthWise Pharmacy is managed by registered pharmacist Katie Westgerdes, a 2013 graduate of the ONU College of Pharmacy.